Artwork Panel: 31.2cm x 65cm ≈ 12¼" x 25½"
Silk/Brocade: 40.3cm x 121cm ≈ 15¾" x 47½"
Width at Wooden Knobs: 49.3cm ≈ 19½"
This is the title for "Karate-Do" in Japanese. This literally means, "Empty Hand Way". Looking at the Kanji, the first means "empty" or "ether". The second Kanji means "hand". 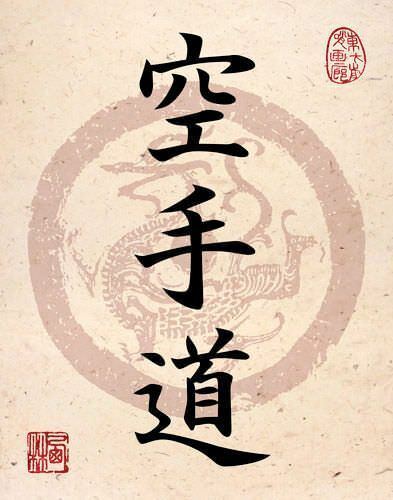 This term is know worldwide as the most famous martial arts of Japan. The origins are thought to come from Kung Fu, but with movements simplified so it is easier to master and use. See our Karate-Do custom Japanese Kanji wall scrolls page for more custom Japanese Kanji calligraphy options.